Assistant Professor of Computer Science Sean Barker is the son of Isaac Henry Wing Professor of Mathematics William Barker. Sean Barker grew up frequently spending time on Bowdoin’s campus, not realizing that one day he’d become a professor alongside his father. 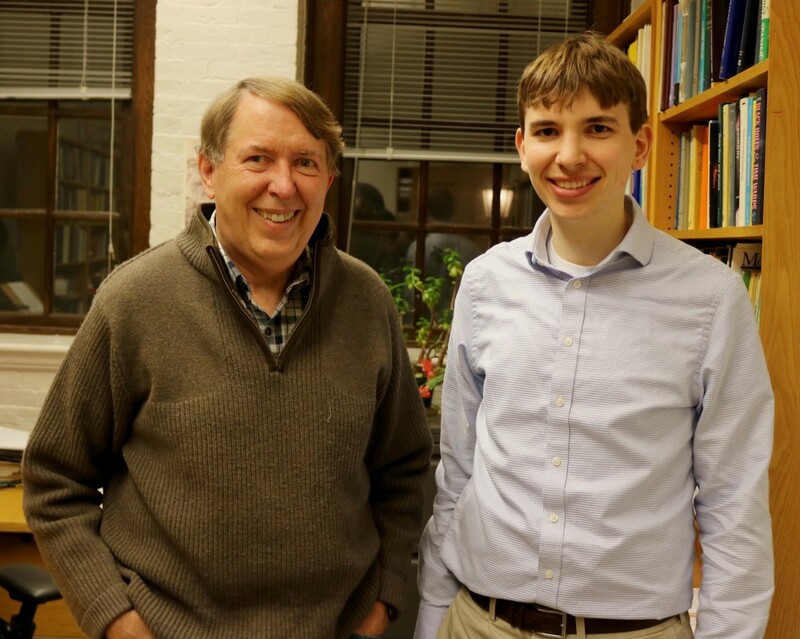 When he took the job at Bowdoin 41 years ago, Isaac Henry Wing Professor of Mathematics William Barker probably wasn’t expecting to one day have his own son as a co-worker. Assistant Professor of Computer Science Sean Barker returned to Brunswick three years ago and joined the faculty and his father as a tenure-track professor. Originally from the New York City area, William Barker began his career at Bowdoin after going to graduate school at MIT and doing a brief instructorship at Dartmouth College. He has worked at the College ever since. Growing up, Sean Barker frequently spent time on campus. Sean Barker’s interest in computers began early­­­—his dad gave him an old Mac laptop to use when he was three­­­—but he hadn’t originally intended to go into teaching. When Sean Barker began looking at various liberal arts schools to start his teaching career, Bowdoin happened to have an opening, and he and his wife decided to move closer to his family. Both Sean Barker and William Barker see many benefits of being able to work with one another in a professional setting. Although they don’t often get lunch or have meetings with each other, working in Searles allows them to see each other with some regularity. For Sean Barker, his dad acts as a source of guidance and advice on campus. “Mostly, it’s just nice to have someone who has been at Bowdoin much longer than I have. So it’s nice to ask questions to someone who has been around long enough to have more of a detailed view of the ins and outs of how things work than I do as a relatively new faculty member,” said Sean Barker. In terms of teaching styles, Sean Barker may be more organized, while his dad brings a level of freneticism to the classroom.